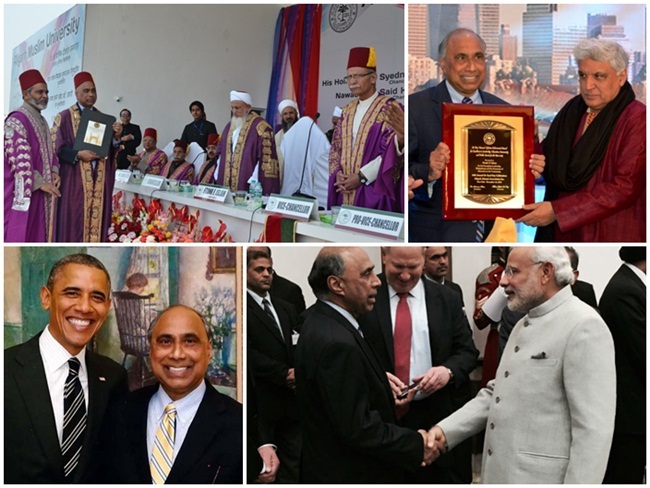 Dr. Frank Islam is one of the few Indian American entrepreneurs and philanthropists who stick to their roots in India. Based in Washington DC, he donated $2 million for the foundation of a business school at Aligarh Muslim University in Uttar Pradesh, India. He visited India and laid the foundation stone for the project in March 2016. The former founder and CEO of the technology firm QSS Group; Dr. Frank Islam belongs to Azamgarh District in the Indian state of Uttar Pradesh where he runs a philanthropic foundation to empower the less privileged with skills for employability. He traveled to the United States from India to realize his ‘American dream’ at the age of 15. Aligarh Muslim University where Dr. Frank Islam graduated from conferred an honorary doctor of science degree on him and named the business school Frank and Debbie Islam Management Complex. In his acceptance speech during the convocation ceremony, he attributed his success as an entrepreneur and leader to the university. The business school at Aligarh Muslim University will nurture the best minds in leadership and entrepreneurship for generations, according to Dr. Frank Islam. The new management complex will consist of an academic area, an administrative area, a faculty area, a library, an open air theatre and an activity room. The Frank and Debbie Islam Management Complex is expected to open its door in 2017. He is also planning to set up a technical college for girls in Azamgarh, which will be named after his mother Qumran Nisan who he describes as ‘a liberator of the human potential.’ This philanthropic initiative is inspired by his mother’s liberal thoughts about education of girls in India. The Qumran Nisan College will empower girls with technical, vocational and professional skills at the post-secondary level of education. This project is awaiting approval from the Home Ministry of India. A computer science graduate from the University of Colorado, Dr. Frank Islam currently heads the F1 Investment Group. He made headlines when President Barack Obama appointed him General Trustee of the Board of Trustees of the John F. Kennedy Center for the Performing Arts. He is a member of several boards and advisory councils including the US Institute of Peace, the Woodrow Wilson Center, Johns Hopkins University, George Mason University, the American University in the Emirates and likes. Said to be worth $300 million among the Indians in Washington DC, Dr. Frank Islam resides in a 40,000 square feet mansion with five bedrooms, a guesthouse, a swimming pool and a backyard tea house in Potomac, Maryland. He had started his entrepreneurial venture with only $500, optimism and never-say-die attitude.